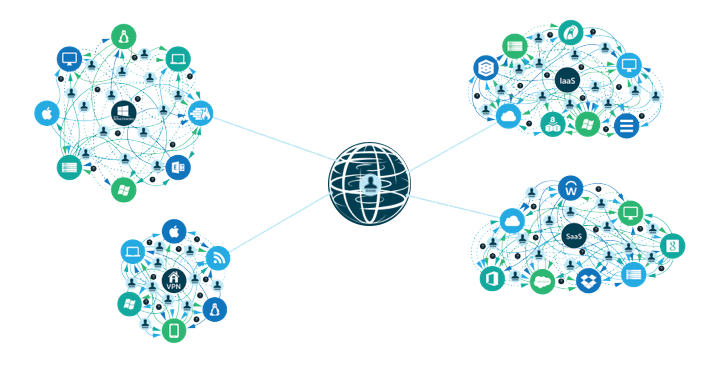 The world is moving to mixed platform environments. With more providers offering excellent solutions to the market, IT organizations have started leveraging more types of providers and platforms. Of course the challenge is that having a variety of platforms traditionally increases the complexity and cost of managing that infrastructure. 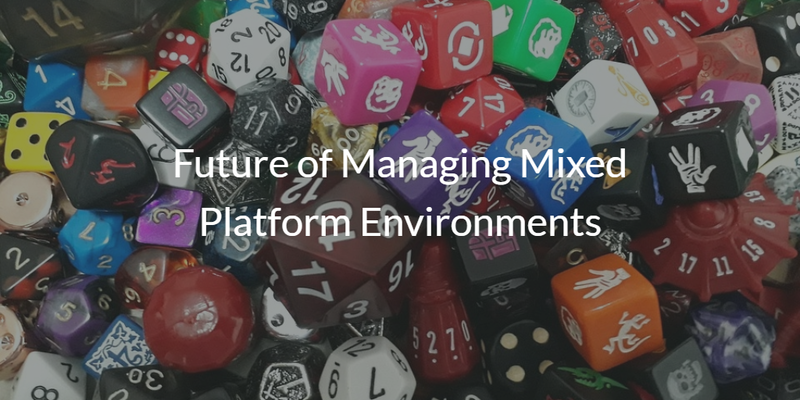 In this post, we talk about the future of managing mixed platform environments, and how it may not be as complicated as you think. For the longest time in the PC era, the IT environment was homogeneous. Microsoft Windows dominated the market with virtually all systems being run on Windows and many of the applications that users needed being produced on top of the Windows OS. In this homogeneous environment, management was a great deal easier. In fact, Microsoft developed tools such as Active Directory® and SCCM to help IT admins manage their IT infrastructure. Of course, the side benefit and a key motivator for Microsoft was the ability to lock-in their customers to Microsoft solutions. An all Microsoft network can be easily managed with Microsoft management tools. This ease of use led to IT admins desiring Windows platforms. However when you tried to use Mac and Linux machines or non-Windows applications on a Microsoft network, it would only add complexity and problems in management for them. Microsoft was obviously not motivated to make it easier to manage non-Windows solutions. Plus, IT admins weren’t excited about purchasing additional management tools at an extra cost to manage a few Macs. This all created the perfect environment for Microsoft. But, the IT world has since changed dramatically. It’s no longer just a few Macs in the environment. Today, only one in five devices is Windows (Forbes). The data center has shifted from being on-prem and Windows-centric to being in the cloud and dominated with Linux. On-prem applications have moved to being delivered from the web as SaaS-based solutions. With all of this change, it is clear to see that homogeneous networks are no longer a reality. This has the downstream impact of making Microsoft-centric solutions such as Active Directory less relevant and less helpful. So, what are IT organizations to do in this era of mixed platform environments? When it comes to identity management there is a new generation of cloud IAM platforms emerging, with Directory-as-a-Service® (DaaS) leading the way. This DaaS platform is focused on connecting users with the IT resources they need regardless of platform, protocol, provider, or location. With this functionality, it means that the cloud identity provider can securely manage and connect users to systems (Windows, Mac, Linux), cloud and on-prem servers (e.g. AWS, Google Cloud, on-prem), web and on-prem applications (via LDAP and SAML, for example), and wired and WiFi networks through RADIUS. This ensures that IT admins can easily manage their mixed platform environments by closely controlling user access. The cloud identity management solution Directory-as-a-Service also has the ability to tightly manage a mixed platform device environment. 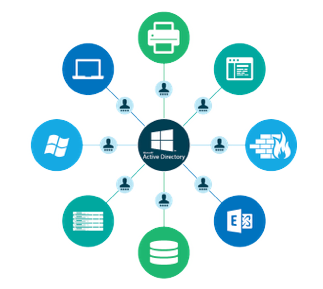 Whereas Microsoft Active Directory has Group Policy Objects (GPOs) for Windows devices, the modern cloud directory has GPO-like functions across all three major platforms – Windows, Mac, and Linux. This ensures that IT admins can control security policies and more on each device without having multiple management solutions. If you would like to learn more about the future of managing mixed platform environments, get a hold of us through our contact page. In the cloud era, alternatives to Microsoft Active Directory and SCCM are making it much easier for IT organizations to enable their workforce with the best IT solutions. Sign-up for a free cloud directory service account and check out how you can control your heterogeneous IT environment. Your first 10 users are free forever.